determine whether your current coverage is too much, not enough, or just right. Even if you haven’t experienced a life changing event, you could be eligible for discounts, or new insurance products may better serve your needs. Homeowners/Rental Insurance: This is a great time to update your home inventory and make sure your homeowners or renters policy is up-to-date. Take photos or video of the more costly items that you own. Remember to note any antique items and their value so you can talk with your insurance agent or insurance company to ensure that they are properly covered. If you need to create a home inventory, the National Association of Insurance Commissioners’ free smartphone app, myHOME Scr.APP.book, helps make the process easier. Download the app from iTunes or Google Play. electronics, art, jewelry or sporting equipment. You may need special coverage, so call your agent to discuss changes for your policy. Auto Insurance: Call your automobile insurance company annually to ask about discounts. Discounts may be available due to your age, employer, or membership in certain organizations – sometimes you can even get a discount by subscribing to a certain magazine. If you have a new job and are driving more or fewer miles to work than you used to, you should make sure you always keep that information current with your insurance company. Review your deductibles for comprehensive and collision coverage. This is the amount you will pay if your car is damaged or totaled without the fault of another driver. Raising or lowering this amount can affect your premium. Before hitting the road, make sure you have a copy of your insurance card and your insurance agent’s number in your vehicle. Delaware now allows for electronic proof of auto insurance. But, since not all states accept electronic insurance cards, it is best to keep a paper copy of your card in your car at all times. Don’t give out any personal information—like your social security number, Medicare number, or bank information—over the phone until you have verified the legitimacy of the insurance company and agent. 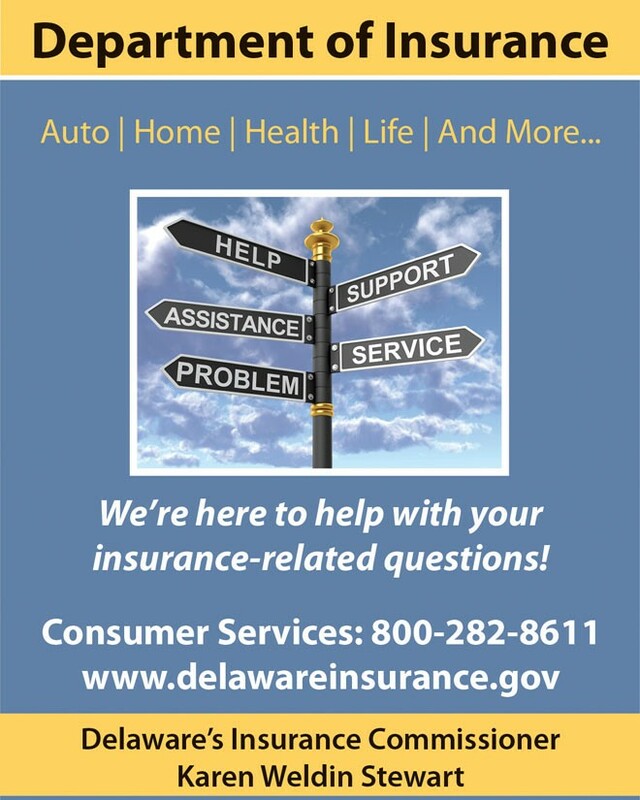 Use the free Licensee Lookup tool on the Department of Insurance website, www.delawareinsurance.gov, to verify the status of an agent’s insurance license. You can also verify a license by calling the Department of Insurance at 302-674-7300. Insurance Commissioner Karen Weldin Stewart has been leading the Delaware Department of Insurance since she first took office in 2009. The department’s mission is: “Protecting Delawareans through regulation and education while providing oversight of the insurance industry to best serve the public.” The department is composed of several divisions that provide services to the public, including: a Consumer Services and Investigations Division and a Fraud Prevention Bureau. Within the Consumer Services Division there are two programs that provide additional services to the public: the Delaware Medicare Assistance Bureau, DMAB, which provides Medicare counseling services to Medicare recipients in Delaware at no-cost; and, the Workplace Safety Program which helps businesses reduce workers compensation premiums by up to 19% annually if the workplace meets certain safety qualifications. Contact us today at 1-302-674-7300 if you need help with an insurance-related issue. Next Story → Sorry, But You’re Too Late!